Fatwa Issued By New Black Panther Party-What Will DOJ & Obama Say Now? The New Black Panther Party of voter intimidation fame, you know that friendly group Eric Holder, Dept. of Justice head loves so much, or that at a minimum refuses to prosecute. Well, here’s what the NBPP is up to now. What say Mr. Fast & Furious now? 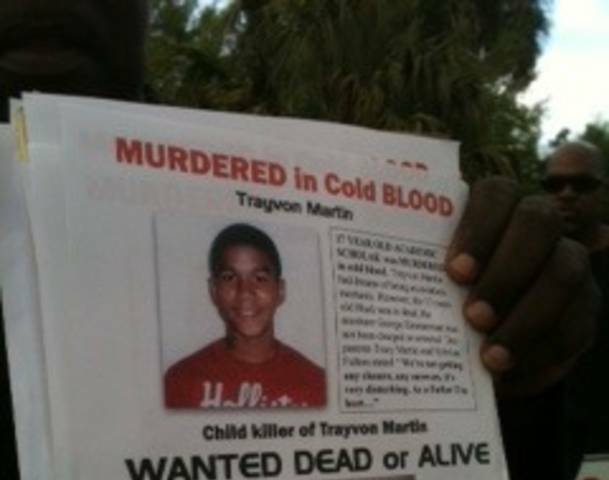 No question, the killing of Trayvon Martin is a tragedy, and Mr. Zimmerman, the Florida neighborhood watch volunteer who shot and killed this teenager must answer for his actions, but does this really help the dialogue? Will President Obama condemn this fueling the fire since he has already chimed in? Will the media condemn the NBPP for this hate speech and overt racism? PS- need a break from politics? Click the travel category on the right side panel to see my travelogue direct from Buenos Aires. Everywhere you look there are just scads of taxis on the road. They’re all small compact cars; body painted black and roofs bright yellow, easy to spot. I’m not sure if they all belong to the same company or not but the meter starts at 7.3 pesos (slightly less than $2) and though much more pricey than the buses (logically called collectivos), or the subway they get you where you’re going faster, more comfortably and sometimes more safely. Like in every vocation or profession, some love their jobs and others not so much, but the happy guy who delivered us to the airport early the other morning on our way to Iguazu National Park was the quintessential taxi guy, rocking to the beat of music, talkative (yes, in Spanish), and a dashboard complete with the family photos, various religious talismans and other do-dads. Buses and taxis may make up as much as 40% of all the road traffic during rush hour and our driver told us there were 48,000 taxi drivers in Buenos Aires making it very competitive. Yesterday though they caught a break. In a dispute between the national and municipal govrrnment the city pulled all police protection from the subway system, effectively shutting it down all day. Good and bad for taxis I guess, conceivably more fares, but traffic even more clogged than usual. GetOffYourButts.com . . . . . . turned travel blog direct from Buenos Aires through early March. Not a lot of contemplation went into this decision and I am not sure why we thought this was a good idea but into the falls we went! The falls are actually a network of up to as many as 275 waterfalls depending on the rainfall and level of the Rio Iguazu. And BTW, check out these catfish (the largest fresh water fish in South America, locally referred to as Sirubi). They were 3-4 feet in length and that’s no fish story! We were with a group of mad-dog Argentines who would shout and cheer “Boca- Boca- Boca” each time the boat captain backed off a little, perhaps checking to see if we’d had enough. Boca Juniors is the pride and joy futbol club every true BsAs resident cherishes so to them it was a just another fight song and with that sort of encouragement El Capitan gleefully turned the boat to give those on the other side the full brunt and pushed once again into the deluge. Iguazu National Park is spread over thousands of acres of river and tropical jungle between Brazil and Argentinia. Iguazu Falls at 72 meters high is considerably taller than Niagra Falls which measures 51 meters, but Niagra produces nearly 4 times the water volume/minute as Iguazu. The river feeding the falls was warm and we were provided thick waterproof bags for our shoes, cameras, etc., however that 3-day forecast of thunder showers that we had escaped in the previous 18 hours finally caught us and the rain was considerably colder, and now we were 200% wet! Taking dry shoes and socks out of the waterproof bag offered only fleeting consolation as we got thoroughly soaked on the fairly long trek back to the park exit (salida) in the downpour. From there it was a bus back to town al Centro for 10 pesos, and from there a 7-block walk (still raining) to Iguazu Jungle Lodge, our hotel where we luxuriated in a long hot shower -thankfully the last drenching of the day. GetOffYourButts.com . . . . . . turned travel blog direct from Buenos Aires until early March. Every morning you see people sweeping their storefronts or apartment entryways, at least sweeping the dirt, leaves or rubbish into the street, but it’s a huge, bustling city and sadly pretty dirty. Also we’ve noticed a lot of dogs but only once have I ever witnessed a pet owner clean up after the dog (see No Doubt About It, You’re Gonna Step in Dog Poop). I jokingly suggested to Mick we may need to visit Singapore next to experience the other side of this coin. Needless to say, we don’t wear our comfortable Hawaii slippahs when we venture out! But we we’re both taken aback the other day when we witnessed a young boy and what looked like his grandparents heartily tearing into these curbside dumpsters. Apparently the trash pickers (Las Cartoneras ) have always been there, a part of any big city in a less developed country. But as a result of the 2001 Argentine sovereign debt crises when the peso was devalued by 50% or more, millions of the middle class were instantly thrown into poverty (Greece today, America tomorrow?) leaving people suddenly unemployed, homeless, dirt poor and having to fend for themselves on the street. The following short YouTube video gives you a window to their world. Please watch it. Now the government, recognizing the vital function the Cartonaras perform has more or less legitimized them, promising them protection and sanctioning the vital recycling job they perform. Specialized trains (which accommodate their carts) are provided to transport the pickers into the city every day as most Cartoneras live on the fringes coming out in the wee hours of early morning or late at night when the traffic and activity has subsided and every street corner is heaped with the refuse of the day. Once the city-provided dumpsters are filled to capacity, people then just toss the garbage in the vicinity of the dumpsters which by days end are over-flowing onto the sidewalk and street. The Cartoneras specialize. Some pick only cardboard or metal or plastic. They get paid by the kilo and sell to brokers who then resell to other recyclers, and sadly many live off the food and other waste they pick through. These Cartoneras and their way of life provides one an opportunity for comparison when we in developed countries talk about the poor along with all the hand-wringing from our politicians who continually seek the disadvantaged or disenfranchized, to use a more current label, who can’t seem to survive without the growing government give-aways. Since it didn’t require another visa or too much hassle we decided to take a side trip to the old, but very well preserved/restored Uruguayan city of Colonia del Sacramento, the oldest city in Uruguay. You have a choice from Puerta Madera on the east side of Buenos Aires of taking the fast ferry (1 hour) across the Rio del Plata to Colonia, or the slow boat which takes 3 hours. Since it was only a day trip, we opted not to waste so much time crossing the river. Remember this is river water, not the Pacific or Atlantic Ocean many of us are accustomed to, and due to the sediment content in the water, it is brown. Old Town Colonia or Barrio Historica surrounded by water on three sides, is a World Heritage site made up of just a few streets that you could walk in an hour or so, but it’s so interesting with the beautiful old buildings, houses and plazas, many dating from the late 1600s, that we happily spent several hours wandering around. The Portuguese founded the city in 1680 and are responsible for many of the historical buildings and the layout of the streets which apparently is quite different from the typical Spanish design. The Portuguese built the gate to the city and a wooden drawbridge in 1745. The Spanish who had settled Buenos Aires on the other side of the river disputed this Portuguese holding and as a result Colonia changed hands back and forth many times with various conquerors until the Treaty of San Ildefonso in 1777. It has remained in Spanish hands since then, which is good because as bad as my Spanish is, my Portuguese is non-existant! Quick aside – we were nowhere near the horrible commuter train crash in Buenos Aires the day before yesterday that killed so far 50 and has injured over 700. In fact we only first learned about it after receiving worried emails from friends and family checking to see if we were okay. So thank you all for your concern, but we’re fat (more so by the day!) and happy as you can see below by some of what we’re ingesting day by day. The typical Argentine breakfast is coffee (maybe cafe con leche, my favorite, or expresso or even expresso doble if you really want a kick start) with 2 medialunas. Medialuna means half moon and they are really a smaller version of our croissant but with a slight sugar glaze and great for dipping in a nice strong coffee. But we usually eat breakfast in the apartment with items from the Supermercado like cereal with fruit or some nice bright orange looking eggs, so we can laze around at our own pace and recover from the previous late night out. How's that for a waker-upper? Not that we’re out partying or clubbing, but we have slipped into the habit of dining late like the locals do and haven’t been getting back from dinner much before 11 PM or so. We’ve tried for 2 nights in a row to get into an Armenian restaurant called Sarkis a block or so from here which we’ve seen recommended on some of the blogs, but the line even at almost 10 PM has been out the door and into the street! It’s the last day of a holiday weekend (Sat, Sun, Mon and Tues), so maybe we’ll have better luck tonight or tomorrow. Yesterday’s somewhat laid-back goal rather than figure out a bus/subway route to a particular point of interest across the city was just to wander around the shops right here in our own neighborhood of Palermo Soho. I’m not really a shopper but it’s always fun to see what’s out there and who knows, I may find a little something I just have to have. But alas, we we’re foiled again by the holiday, with most shops still closed. I did say most but not all, and we managed to drown our sorrows with a coffee and a bite of chocolate cake, which I swear tasted like a huge piece of fudge! Yep, those are blueberries and bosenberries on top!